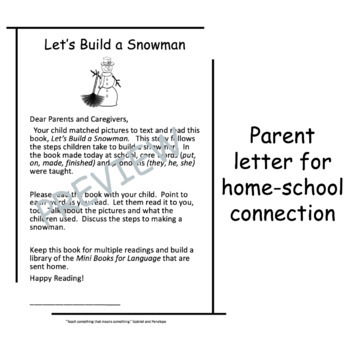 This printable black and white Mini Book for Language: Let’s Build a Snowman is perfect for a home to school connection. The students complete the mini book at school and take it home to read with their parents. Core word vocabulary (e.g. made, put, on, finished), pronouns (e.g. they, he, and she) and fringe words relating to a snowman are used to tell a story about two children building a snowman. Language comprehension and expression are the focus as the students match visual sentence strips to picture choices, answer wh- questions, and retell the steps sequentially. 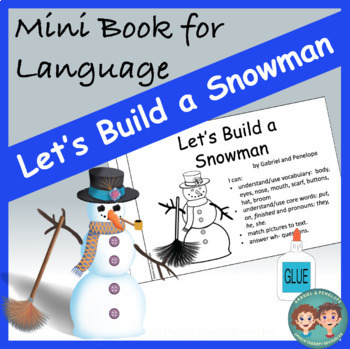 The mini book introduces a boy and girl who build a snowman. They put items on the snowman until they are finished. Using the visual sentence strips as support, your student makes a picture choice and glues the picture on the page. 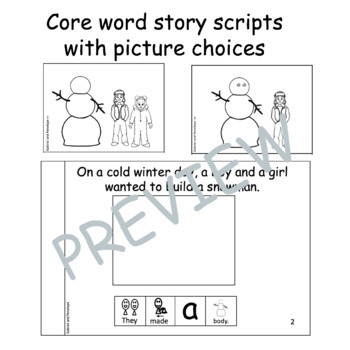 Your students will learn the meaning of words associated with the building a snowman, understand and use core words, and use descriptions and picture clues to make logical choices. 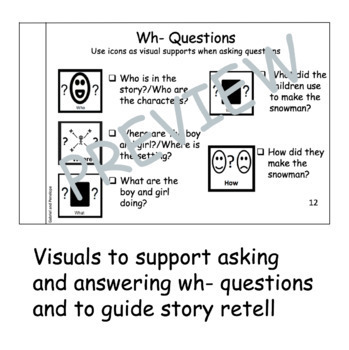 They answer wh- questions and are given the opportunity to retell the steps in sequence. This mini book for language encourages carryover of school lessons to home. Please contact us with any questions at gabrielandpenelope@gmail.com.